This blog post presents five-year trends for: 1) total short-term liabilities in the Governmental Funds, and 2) short-term liabilities as a percentage of operating revenues for the City of Chicago and Cook County. Increasing short-term liabilities in a government’s operating funds as a percentage of net operating revenues may be a warning sign of possible future financial difficulties. The short-term liabilities to net operating revenues ratio, developed by the International City/County Management Association (ICMA), is a measure of budgetary solvency or a government’s ability to generate enough revenue over the course of a fiscal year to meet its expenditures and avoid deficit spending. The data for these trends were found in the Governmental Funds Balance Sheet in each Government’s Comprehensive Annual Financial Report (CAFR). More detailed explanations of five-year short-term liability trends can be found in the Civic Federation’s annual budget analyses of these and other major Chicago-area local governments. The two governments report different types of short-term liabilities on their Governmental Funds Balance Sheets. They are described below. Lines of credit and commercial paper: Lines or letters of credit are commitments issued by a bank or other financial institution to provide a short-term loan for certain purposes. Commercial paper is a type of short-term borrowing whereby a government issues a security that can be traded by the lender to other parties. Other liabilities: include self-insurance funds (the County is self-insured for various types of liabilities, including medical malpractice, workers’ compensation, general automobile and other liabilities), unclaimed property and other unspecified liabilities. The following chart displays the five-year trends of total short-term liabilities in the Governmental Funds for the two major local governments that are examined in this blog. This chart is not intended to directly compare current liabilities between the two local governments, which are different in size and have different purposes, but rather to show each government’s overall trends. A $9.7 million rise in accrued and other liabilities. These increases were offset by an $18.5 million, or 49.1%, decrease in claims payable. 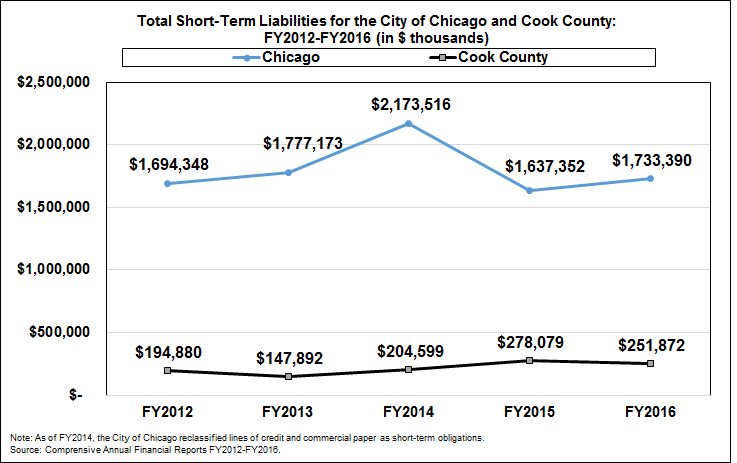 Cook County short-term liabilities totaled $251.9 million in FY2016. This is a decrease of 9.4%, or $26.2 million, from the prior fiscal year. Much of the change was due a $17.2 million decrease in accounts payable due and $17.5 million decrease in accrued salaries payable. The decline in accounts payable between FY2015 and FY2016 is primarily due to a $25.0 million reclassification entry to correct grant balances as part of the year-end financial reporting entries. The decrease in accrued salaries payable between FY2015 and FY2016 is primarily due to the 2015 balance including a non-recurring accrual of approximately $14.0 million for retroactive salaries to reflect the impact of new collective bargaining agreements approved by the County Board in late 2015, which was paid out in in 2016. Since FY2012, short-term liabilities have increased by nearly $57.0 million, or 29.2%, from $194.9 million in FY2012 to $251.9 million in FY2016. Accounts payable have always been the largest share of Cook County’s short-term liabilities, averaging 55.6%. As previously noted, increasing current liabilities in a government’s operating funds at the end of the year as a percentage of total operating revenues may be a warning sign of future financial difficulties. The use of ratios allows for some comparison across the two governments examined in this blog, but caution is required before reading too much into any one trend or indicator. Between FY2012 and FY2016, Chicago’s ratio of short-term liabilities to operating revenues increased from 29.1% in FY2012 to a high of 35.9% in FY2014 before declining to a low of 25.0% in FY2016. Overall, it dropped 4.1 percentage points from 29.1% to 25.0% over the five-year period of this review. Chicago’s ratio averaged 29.6% over the 5-year period. The Chicago ratio was consistently higher than the corresponding ratios for Cook County. 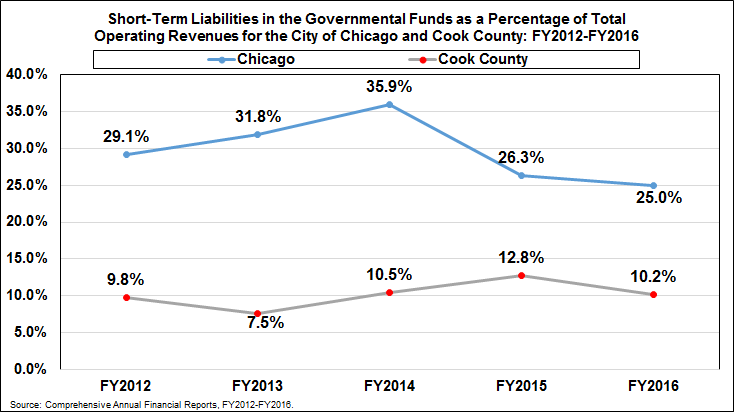 Cook County’s ratio of short-term liabilities to total operating revenues has fluctuated slightly over the five-year period, rising from 9.8% in FY2012 to 12.8% in FY2015. In FY2016, it fell again to 10.2%, primarily due to a decline in accounts payable and amounts held for outstanding warrants. The ratio averaged 10.1% over the five-year period. Operating funds are those funds used to account for general operations – the General Fund, Special Revenue Funds and the Debt Service Fund. See Karl Nollenberger, Sanford Groves and Maureen G. Valente. Evaluating Financial Condition: A Handbook for Local Government (International City/County Management Association, 2003), pp. 77 and 169. City of Chicago FY2016 Comprehensive Annual Financial Report, p. 55. Information about the City of Chicago’s use of letters of credit and commercial paper in FY2016 can be found in the FY2016 Comprehensive Annual Financial Report, p. 96. A. John Vogt. Capital Budgeting and Finance: A Guide for Local Governments (Washington, D.C.: ICMA, 2004), p. 389. Steven A. Finkler. Financial Management for Public, Health, and Not-for-Profit Organizations (Upper Saddle River, Prentice Hall, 2001), p. 552. See Business Dictionary at http://www.businessdictionary.com/definition/retainage.html. See Cook County FY2015 Comprehensive Annual Financial Report, “Contingency – State Treasurer Claim,” p. 106. Information provided by Cook County Budget Office on November 20, 2017.